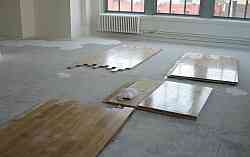 On-site testing of different flooring samples for sound transmission characteristics. 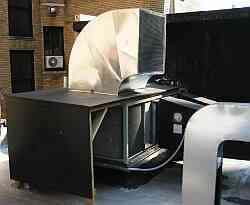 Checking and correcting improperly soundproofed air conditioners. How would you like to have this recording studio under your apartment? 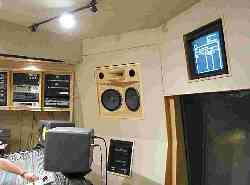 We forced them to completely rebuild their improperly-soundproofed studio. voices, footsteps and exercise machines. Mechanical equipment such as air conditioning units, fans and blowers, pumps and elevators is anothercommon source of noise. [Read about a recent case] The operation of a Measurements, like statistics, can be used improperly. Click here to see how this can affect you. commercial business in a residential building, especially one that operates at night such as a bar or restaurant, frequently requires special sound isolation measures. Many residents find street noises objectionable. Some people, such as musicians, make more noise than the average person and may need to keep sound from traveling out of their apartments. Lastly, some dwellings are so poorly isolated from one another that privacy is compromised. Recording System. We can help with all these problems. The first step is to identify the source of the noise, which is often something other than what the client thinks it is. The next step is to measure the noise. The third step is to determine the transmission paths between the source and the listener. We will then write a report to document the problem and design measures to fix it. We can work with your contractor or recommend one to you who is experienced in this type of work. In code compliance cases we can determine if the noise is within legal limits. If it is not, our report can be a powerful bargaining chip to convince the building management (or the owner of the noise source) to correct the problem. Should they remain unwilling to do so, we can provide expert witness testimony in court on your behalf. Perhaps you think your problem is unusual? Even unsolvable? You might be surprised. Our Job Types page has a sampling of the kinds of problems we have tackled in the past. Please visit our Testimonial Letters page, which includes letters from Residential Clients. This air conditioner is quiet inside, but the outside half caused neighbor noise complaints. We guided the condo management through the repair process. The pumps installed over our client's bedroom were soundproofed improperly. By pointing out the violations in the Noise Code and Building Code, we convinced the building management to reinstall the equipment. The result was a 13 decibel drop of sound, which is a major improvement. By documenting the amplifier settings and wiring using photos like this one, we were able to show that the Club owners were attempting to pull a fast one during a court-ordered sound test. The Court shut down the Club, much to the delight of the upstairs neighbors.